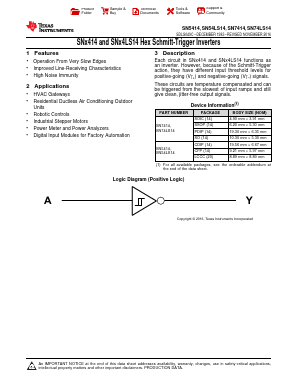 Each circuit in SNx414 and SNx4LS14 functions as an inverter. However, because of the Schmitt-Trigger action, they have different input threshold levels for positive-going (VT+) and negative-going (VTâ) signals. These circuits are temperature compensated and can be triggered from the slowest of input ramps and still give clean, jitter-free output signals. 74HC14 HEX INVERTERS WITH SCHMITT TRIGGER INPUTS View Diodes Incorporated. 74LVC14A HEX INVERTERS WITH SCHMITT TRIGGER INPUTS View Diodes Incorporated.